If extreme, unusual and challenging scuba diving scenarios appeal to you, try diving under the ice. Ice diving is one of the most adventurous scuba specialties because you confront conditions and see beauty few others ever experience. Plus, you might get a chance to play with your exhaled bubbles on the bottom of the ice. Flash your PADI Ice Diver certification card to get instant respect, and usually a lot of questions from other divers about what it’s like under the ice. You need to be a PADI Advanced Open Water Diver who is at least 18 years old to enroll in the Ice Diver course. 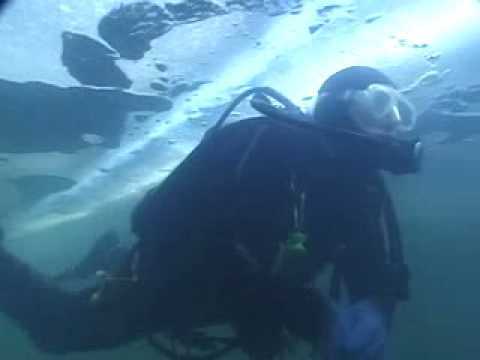 •Using specialized ice diving equipment and safety lines. •Signals and communications along with line tending and line-securing techniques. •Handling problems and safety diver procedures. Besides your basic scuba equipment, you’ll definitely want to dive in a dry suit. Your MDC PADI Instructor or local dive center staff will suggest other gear appropriate for ice diving, such as a collapsible snorkel that fits in your pocket, redundant air supply such as a pony bottle, and other technical diving equipment.